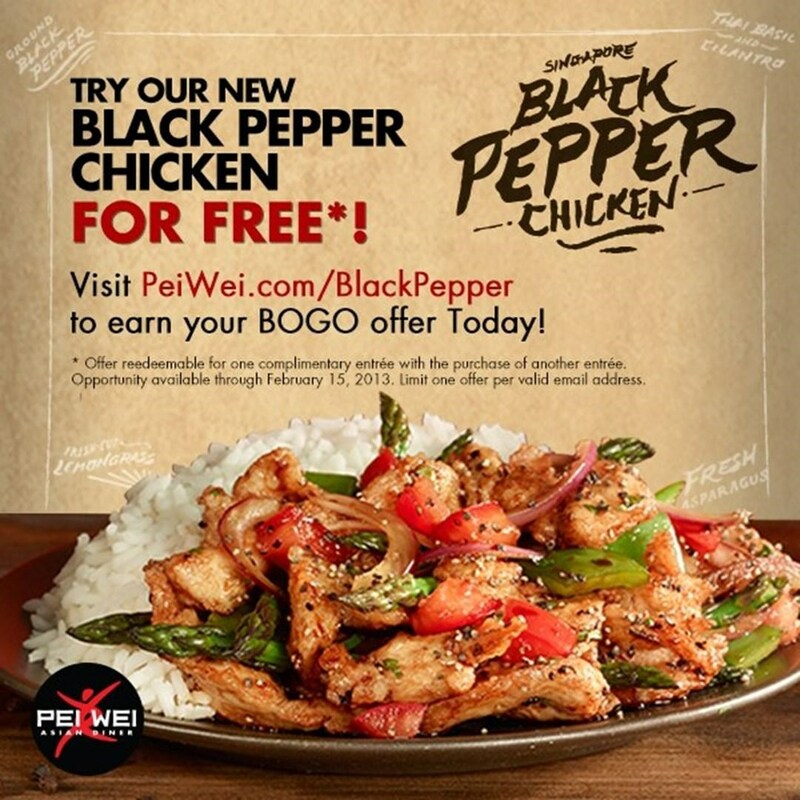 Beginning today, Pei Wei Asian Diner fans will be able to experience the flavor of the fast-casual restaurant’s new limited-time-offer dish, Black Pepper Chicken. The flavors were inspired by ingredients discovered in Singapore during Pei Wei’s annual culinary exploratory trip to Asia. Singapore is a cultural melting pot that has been called “the capital of the spice trade,” with a history dating back centuries. 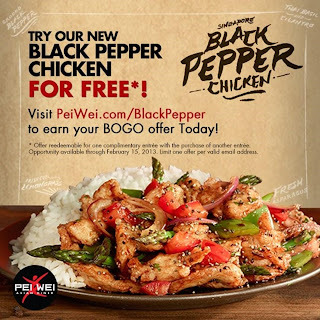 In honor of the new Black Pepper Chicken dish, Pei Wei is offering a buy-one-get-one offer for fans that visit www.peiwei.com/blackpepper and watch a video about the inspiration behind Black Pepper Chicken. The Black Pepper Chicken dish is seasoned with coarse ground black pepper, accented with a rich soy sauce and wok tossed with fresh asparagus, tomatoes, green bell peppers and onions. It is finished with aromatic Thai basil and cilantro. The dish can be ordered “Stock Velvet,” in which the chicken is poached in vegetable broth instead of wok fried, reducing fat by 30 percent. All of Pei Wei’s menu items are priced under $10. Black Pepper Chicken will be available from February 4 to May 5, 2013.